Get your friends together for the ultimate soul party on Saturday 23 February 23 with classic songs performed by a stellar line-up of artists at the Eventim Apollo Hammersmith. The ultimate Motown and soul diva Martha Reeves joins the party with legendary tracks from Heatwave to Dancing in the Street. Already on the incredible line-up is multi award-winning and legendary artist Gabrielle, who takes her place on the stage alongside the Kenny Thomas and ex-Rose Royce front woman Gwen Dickey. Other incredible acts include funk band The Brand New Heavies (Midnight at the Oasis), British singer-songwriter Jaki Graham (Could it Be I’m Falling in Love and Set Me Free), voice of Strictly Come Dancing Tommy Blaize, The Voice UK finalist Michelle John and star of the cult film The Commitments, Andrew Strong (Mustang Sally). This extraordinary evening of live music will be hosted by award-winning Magic Radio presenter Angie Greaves & Brit Award winner and multiple MOBO winner Lemar. 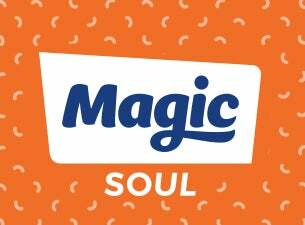 Head to magic.co.uk to buy your tickets and join us for the ultimate soul experience!